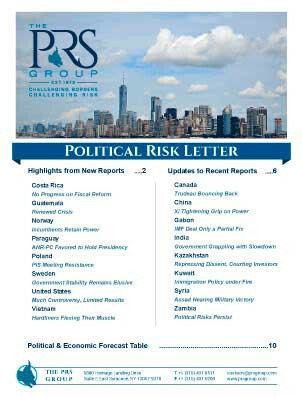 A monthly newsletter that summarizes the latest forecasts by Political Risk Services for economic and political changes affecting international business. 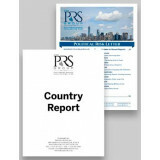 Each issue also includes the "Political and Economic Forecasts Table," which includes 18-month and five-year forecasts for turmoil, investment, transfer, and export risk in all 100 countries and forecasts of real GDP growth, inflation and current account. Prices cover a current issue or a 12-month subscription, and print pricing includes shipping/handling fee. Appropriate taxes will be added. Available in print, or via e-mail link as a PDF file. 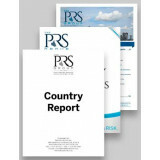 Back issues (since 1997) also available (inquire about details by contacting PRS Customer Service at custserv@prsgroup.com). NOTE: The Political Risk Letter is included as part of a World Service subscription or any Regional Service subscription.